Like what you have been reading here? Subscribe now and receive email updates of our articles. As Hurricane Irma bears down on the tropics and Florida, and the clean-up from Hurricane Harvey in Texas and Louisiana continues, many minds are on what they would do in case of an impending weather crisis. 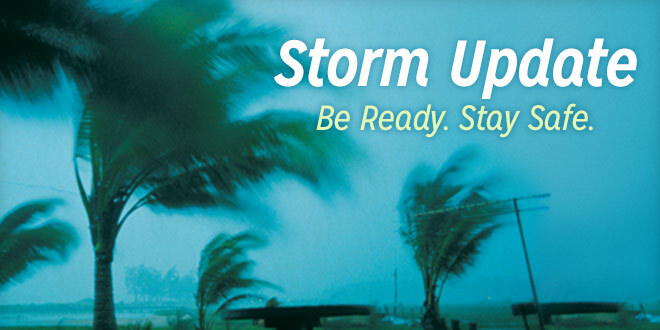 Here is a hurricane preparedness checklist to make sure you’re ready for a natural disaster. Get cash from your ATM–in case of a power outage, our debit and credit cards will be unusable. Get enough money to last a week to ten days, depending on your forecast. If possible, have necessary prescriptions refilled if they’re close to renewal. Find out where the nearest evacuation shelter is, and get a list of what you need to bring for your stay. Gather these things and have them ready to go, if necessary. Secure anything outside that can be blown around in a storm, or store those items in the garage. Make sure your home is secure, check for loose storm doors, loose siding, and see that windows are protected either by storm shutters or strong plywood cut to fit your windows, and have a handy person attach them. Fill all your vehicles’ gas tanks. Batteries and flashlights are very important, as is a battery powered radio. If you rely on cell phones for contact, buy and charge portable chargers ahead of time. Flooding is always a possibility, so get as many things off the floor that you can. Take precious items, photos and important documents and put them in plastic containers and store them in the attic, if possible. Pack enough clothes and necessities for a few days’ stay for each family member. If possible, allow children to pack their things in a book bag so they can help carry the load. Gather your important papers, put them in a large, plastic zipper bag, and pack them with your clothing. You can also use your camera phone to take photos of important documents. Pets are considered family, and many people don’t want to leave them if they decide to evacuate. Ask your vet for shot records in case you can take them with you to an emergency shelter. Notify family and friends of your plans. Unless there is a mandatory evacuation for your area, you can decide to stay at home and ride the storm out. Water is an absolute necessity–fill every empty container that has a lid with clean water. Cooking pots and casserole dishes work well, too. Clean and fill your bathtub with water for bathing and flushing. Just keep the bathroom door closed so little ones won’t be tempted to climb in the tub for a swim. Start your icemaker now, and bag ice in plastic zipper bags or plastic Tupperware-like containers. Store as much as you can. Go ahead and prepare and eat any perishable foods before the storm. Stock up on read-to-eat foods. Keep your freezer as full as possible, or use some of the ice and containers filled with water to keep it packed. A full freezer keeps food cold longer during a power outage. Hurricanes are storms to respect. Prepare as soon as possible–it is better to be prepared early than sorry. Whatever you and your family eventually decide is a very important decision–don’t risk your lives for something that can be replaced. Follow your local government’s emergency management team’s advisories, and follow a reliable weather source for updates from the National Hurricane Center. Access Teri’s one-stop Orlando FL home search website. Teri Isner is the team leader of Orlando Avenue Top Team and has been a Realtor for over 24 years. Teri has distinguished herself as a leader in the Orlando FL real estate market. Teri assists buyers looking for Orlando FL real estate for sale and aggressively markets Orlando FL homes for sale. You deserve professional real estate service! You obtain the best results with Teri Isner plus you benefit from her marketing skills, experience and ability to network with other REALTORS®. Your job gets done pleasantly and efficiently. You are able to make important decisions easily with fast, accurate information from Teri. The Orlando Avenue Top Team handles the details and follow-up that are important to the success of your transaction. Get Orlando Daily News delivered to your inbox! Subscribe here!